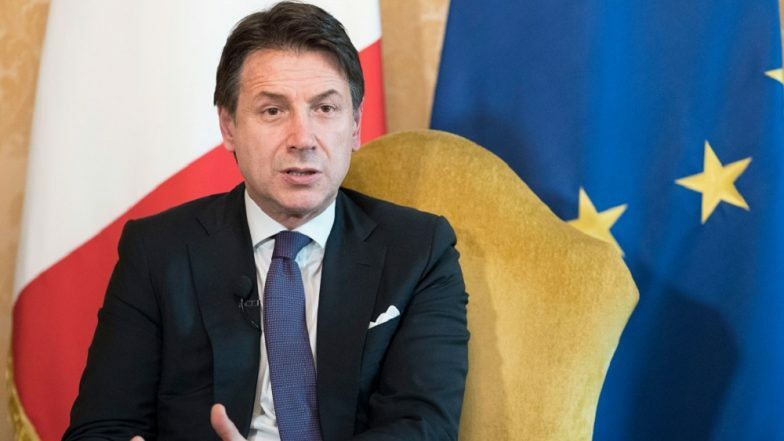 Rome, April 16: The risk of foreign fighters arriving in Italy among an influx of refugees from Libya is alarming the populist government, which is seeking to halt the escalating warfare in the chaos-hit North African country, Premier Giuseppe Conte said on Tuesday. "We are very worried about the Libyan crisis. We will continue trying to avoid a humanitarian disaster that could also expose Italy to the threat of foreign fighters entering our and other European countries. "This is why we absolutely must forestall this (military) escalation," Conte said. Some 400 Islamic State fighters currently detained in Tripoli and in the northwest city of Misrata may take advantage of the turmoil in Libya and flee to Europe, Libya's United Nations backed government's Deputy Premier Ahmed Maitig told the foreign press here on Tuesday. France and Italy Embroiled in Massive Diplomatic Spat. Conte and Foreign Minister Enzo Moavero Milanesi met Maitig and Qatar's Deputy Premier and Foreign Minister Mohammed al-Thani for talks in Rome on Monday aimed at a truce in the deadly fighting this month in Tripoli between eastern military strongman Khalifa Haftar's militia and forces loyal to the UN-backed government. Conte called for an immediate ceasefire and urged Haftar to withdraw his self-styled Libyan National Army forces from Tripoli while Thani tweeted that Haftar's offensive was "the principal obstacle to international efforts towards national dialogue". IS-linked fighters are among some 800,000 refugees set to head to Italy from war-wracked Libya, its UN-backed premier Fayez al-Sarraj told Corriere della Sera newspaper on Monday. A total 174 people have been killed and over 750 wounded since Haftar ordered his LNA to enter Tripoli earlier this month, while some 18,000 have fled their homes, according to the UN.